'The Wolery' at Pooh Corner on Townsend, is a unqiue property that may take you back to the 100 acre wood and your childhood of reading Winne the Pooh. 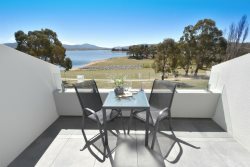 The property has manicured gardens and sits right on the Lake foreshore to enjoy walks along the waters edge. During summer swim at your back door! As you walk inside you are greeted with a distinct Mountain Feel with decor that simple exudes a warm and comfortable holiday will be enjoyed. A wood fire crackles away as you can sit and watch the water change moods throughout the day. There is a fully equipped wood kitchen and 2 bedrooms for a family of 4. Heating is electric with underfloor heating in the living areas. There is also an area to store your ski and summer toys. With 2 bathrooms you will never have to wait. One has a great spa bath to relax after a hard days activities. Please come and enjoy family time at the Wolery at any time of the year! Street Parking only available. Drop off at property allowed.